Summary: After trained examiners and accomplished business professionals performed a thorough assessment of this work, Jeffrey K. Liker and Karyn Ross have been selected as recipients of an internationally recognized award from the Shingo Institute, part of the Jon M. Huntsman School of Business. The authors will receive the award at the Shingo International Conference occurring April 24-28, 2017 in Atlanta, Georgia. Dr. Liker is professor of industrial and operations engineering at the University of Michigan and president of Liker Lean Advisors, LLC – a collection of top-notch lean advisors. He is author of the international best-seller, “The Toyota Way” and many more related articles and books, which have earned him an astonishing 13 Shingo awards. Ms. Ross, an experienced consultant, highly skilled coach and accomplished lean practitioner, specializes in teaching organizations how to use creativity in combination with the ground-tested principles and practices of “The Toyota Way. By “challenging” or applying for an award, authors invite a group of accomplished professionals and trained examiners from the Shingo Institute to thoroughly review their publications. Shingo examiners select recipients based on a rigorous set of standards. 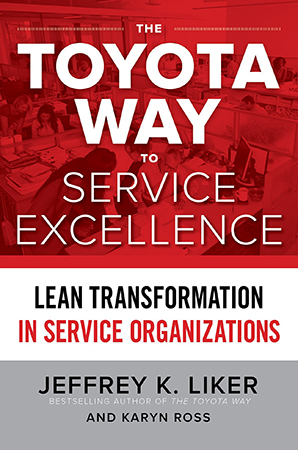 A must-read for service professionals of every level, “The Toyota Way to Service Excellence” takes the proven Lean principles of the bestselling “Toyota Way” series and applies them directly to the industries where quality of service is crucial for success. Dr. Liker and Ms. Ross show how to develop Lean practices throughout an organization using the famous 4P model. Whether you are an executive, manager, consultant, or frontline worker who deals with customers every day, you’ll learn how take advantage of all Lean has to offer. With this book as a guide, you’ll gain a clear understanding of Lean and discover the principles, practices and tools needed to develop people and processes that surprise and delight customers. These ground-tested techniques are designed to help make continuous improvements in services, streamline operations, and add ever-increasing value to customers. Fascinating case studies of Lean-driven success in a range of service industries, including healthcare, insurance, financial services, and telecommunications, illustrate that Lean principles and practices work as well in services as they do in manufacturing. Drawn from original research and real-world examples, “The Toyota Way to Service Excellence” will help you make the leap to Lean. The authors will receive the award at the awards ceremony during the Shingo International Conference in Atlanta, Georgia, USA on April 24-28, 2017. The conference is a week-long event featuring a selection of workshops, plant tours, keynote speakers and breakout sessions designed to provide ongoing knowledge, insights and experience for organizations in pursuit of operational excellence.